Winter is the time to button up your house tightly so you don’t let heat escape. Making up for that lost energy drives up your energy bills. But maybe you closed up your house too tightly. You may not be just keeping the heat in your home, but trapping bacteria, viruses, even airborne mold spores. An easy way to circulate fresh air into your home is to open a window, but that’s not a viable option deep in a Michigan winter. A better option for you may be an air purifier that removes dangerous pathogens from circulating through your home. While a room air purifier eliminates some of the problem, unpurified air continues to circulate throughout your house and even into the room where the purifier is located. The best solution for your home is an air purifier that connects to your current heating and ventilation system to purify 100 percent of the air circulating through your system. This solution not only purifies the airborne pathogens in your rooms, it also prevents germs and mold caught up in dust in your air ducts from being introduced into your living space. 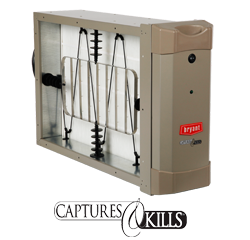 At Engelsma Heat and Cooling, we offer a full line of Bryant air purifiers for homes in the Grand Rapids area. Bryant’s two styles of its Evolution Perfect Air Purifier kills or deactivates 99 percent of the pathogens and irritants it captures. These Perfect Air Purifiers don’t just filter air, they re-purify the air each time it goes through the system, which can be as often as eight times per hour. Bryant’s purifiers also eliminate the sound irritation you can get from a room purifier, which can be noisy when you’re sitting near it. All of Bryant’s air purifiers are silent. They’re attached next to your ventilation system next to your furnace, out of sight and out of hearing range, while offering the peace of mind that you have protected yourself and your family from the maladies that often strike this time of year. If you’re interested in seeing what a Bryant air purifier can do for your home, give Engelsma a call today at (616) 453-0833. This entry was posted in HVAC and tagged air purifier. Bookmark the permalink.